Our household prefers savory over sweet for breakfast. That is the reason why you will see over a dozen savory options in my recipe archives for breakfast. I believe it is the case in most Indian households. 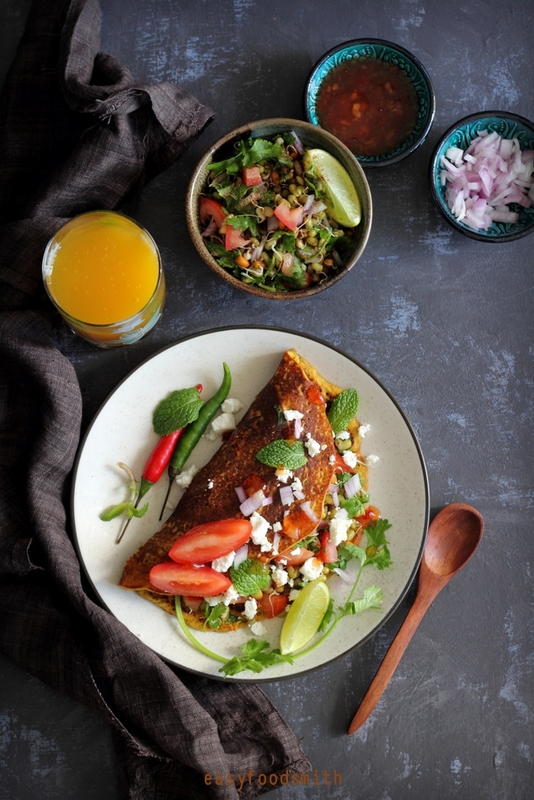 We Indians love our dosas, idlis, vadas, stuffed flatbreads, savory pancakes or chilas, and so much more that you can imagine! We even have gluten free and vegan savory cake called Handvo. As a matter of fact, there are plenty of gluten free options in Indian cuisine and many vegan options too. There is something for everyone I believe 😀 If we feel like eating something sweet once in a while we stick to having Daliya (cracked wheat porridge) than oats or enjoy a simple bowl of Dahi Chiwra (flattened rice with yogurt). 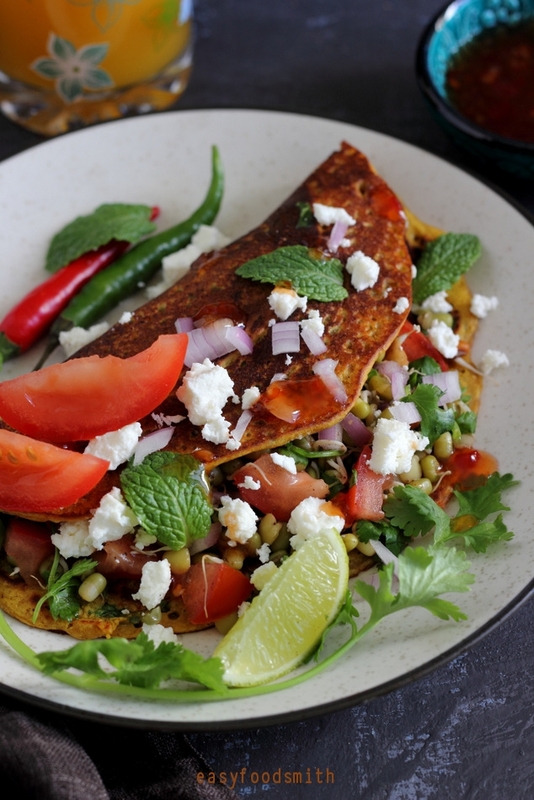 I have seen the blogging world using the term vegetarian omelette for the besan ka chila, so I have used the same for those who are not aware of what besan ka chila is. Also, I turned the simple chila into a meal by loading it with the goodness of sprouted mung beans, black chick peas and lentil salad. It is satiating and tasty gluten free and vegan option and provides a kind of balanced meal. In another mixing bowl, whisk besan, red chilli powder, turmeric, coriander powder, garam masala, cumi powder, dry mangno powder, salt and baking soda. Add Yogurt and half a cup of water. Whisk and add ginger garlic paste and chopped fresh coriander. Add more water if required. The batter should be not thick or thin but of pouring consistency. Cook for a minute or till the crepe starts becoming light brown in colour. Remove on the serving plate and serve with the sprout salad filling, garnished with feta cheese. I served it with sweet chili sauce which paired really well. Feel free to use any chutney that you fancy. ENJOY!!! Note: I have mentioned a certain amount of water, however, I suggest that you start with using half a cup of water and then add a few table spoons gradually as required. 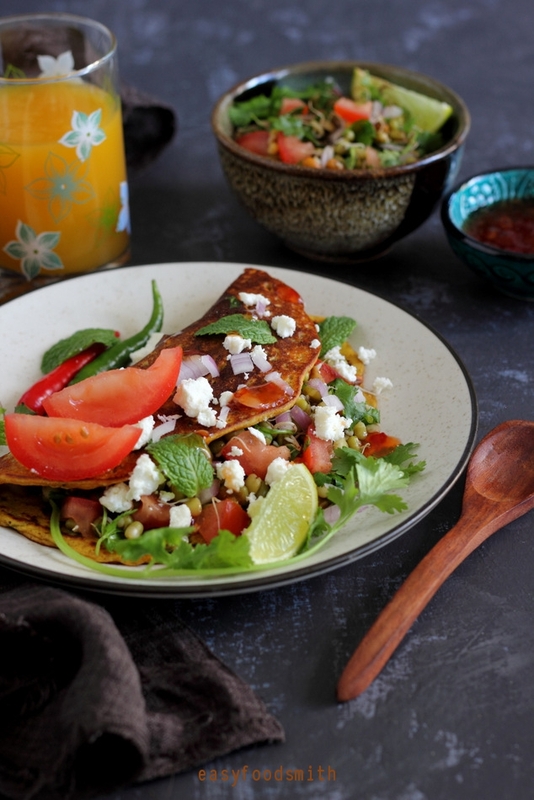 Note: Feta adds a beautiful dimension to the salad, especially with these crepes therefore I vehemently suggest adding it to this meal. I can’t get enough of healthy and delicious food like this! One of those perfect quick meal for any day. And it’s healthy! I love how you loaded it. Thanks Kankana. I love such meals during summers that are light yet satiating. It does make for a very healthy and tasty meal. Exactly there are so many gluten free options in Indian cuisine that I never miss other things. 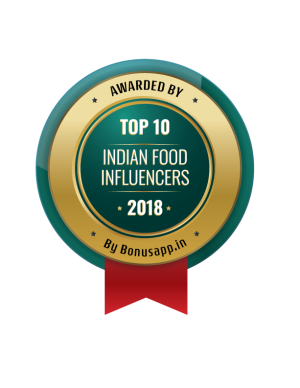 Handvo, dahi chiwra and oats porridge, besan cheela are regular breakfasts at our home.Your sprouts loaded besan cheela sounds perfect for me. Absolutely Balvinder. I love how balanced and smart meals our ancestor cooked! That is one gorgeous omelette. Love the pics. I have been eating more hefty omelettes like these for lunch and dinner too. I just posted one funny enough. The spies here must give it a wonderful flavor. I agree, savory is the way to go in the morning! My husband will bring home donuts when he stops by the bakery to pick up bread. Sweets just make me more groggy. I’d love your veggie-packed omelette. It’s beautiful. 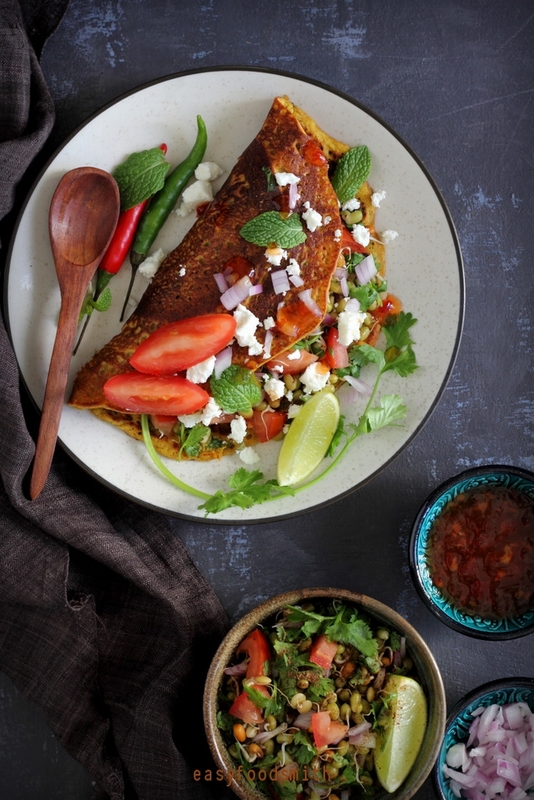 Love the way you do an omelette! Wrapping it around a salad is genius! I just throw the vegetables in the egg mixture and hope, that when it folds, it doesn’t break. Not only does it normally break, but it limits what vegetables I can use. I love the idea of a salad omelette. And now for the egg part and all of those spices. Definitely, an inspirational meal for breaking old habits. Thank you for sharing this! Taruna, forgive me for not reading the post and recipe more closely. I came to go through the ingredients and get what I don’t have to add to my grocery list, and I noticed that this is definitely not the traditional omelette I’m familiar with. No eggs! That makes it even better. Just added chickpea flour to the grocery list. Plan to make this over the weekend. No need to apologize my dear. It happens sometimes 🙂 Would love to hear how they turned out for you. I made this for supper tonight and we both loved it! My salad was a little different, using what I had, but it worked. The crepes are delicious and I will be making this again. Thank you for delicious vegetarian meal for us! We’re trying to eat less and less meat, so meals like this make it easy.